This next submarine designer/builder had a longer career than most, and may have had greater influence than any submariner of the 19th century, though we will never know conclusively. Brutus de Villeroi a Frenchman born in 1794 and died in 1874 born in Tours, but lived most of his life in Nantes. Yes the same Nantes that Jules Verne grew up in. 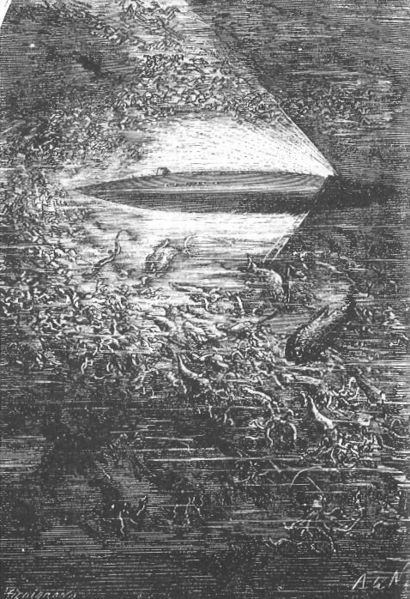 It is quite possible, though impossible to prove, that young Jules Verne may have witnessed the testing of one of Villeroi’s submarines. Image by illustrator Neuville for the book. What we do know is that Villeroi was, supposedly, a professor of drawing and mathematics at Saint-Donatien Junior Seminary in 1842, though the records proving it have not been found as of yet. This was at the same time Jules Verne attended the same seminary. Verne also maintained friendships with people from Nantes for the rest of his life. So it is possible that Verne’s Nautilus may have been inspired by Villeroi’s Nautilus, which in turn inspired untold thousands to become submariners. 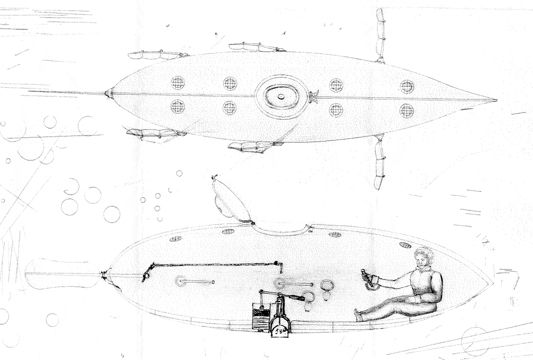 Villeroi built his first submarine in 1832 and named it Nautilus after Robert Fulton’s Nautilus. Villeroi’s Nautilus was 10 feet 6 inches long, 27 inches high, and 25 inches wide displacing 6 tons when submerged. The submarine had eight dead-eyes along the top to allow in light. It also had a retractable conning tower with a hatch. The ship was propelled by three sets of duck-foot paddles. The ship had a crew of three. The submarine was demonstrated near Nantes, France on 12 August 1832. For the next 31 years Villeroi tried to sell his various submarine designs to the French navy, but was turned down every time. In 1856, he immigrated to the United States and continued to work on his submarine designs. His first American built submarine was a salvage submarine captured by the Philadelphia police as it sailed up the Delaware River on 16 May 1861. This got the attention of the Philadelphia Navy Yard, which led to a contract to build a much larger submarine for the United States Navy. The submarine was over budget and over time. The submarine, named the Alligator, was 30 feet long and 6 feet in diameter. It had 16 hand operated paddles for propulsion. Air was supplied through an air pump attached to two hoses connected to two floats on the surface. The submarine was sent to Norfolk, but no one really knew what to do with it. Finally the submarine was sent back to the Philadelphia Navy Yard and the propulsion was replaced with a hand cranked screw propeller. This improved her speed to four knots. Admiral du Pont ordered the submarine to Charleston to take part in an attempt to take the city. While the submarine was being towed to Port Royal, South Carolina by the USS Sumpter the two ships were caught in a storm and the Alligator was cut loose and sank on 13 June 1862. Although the Alligator was the United States Navy’s first submarine, it was never a commissioned ship in the United States Navy, so it was never the USS Alligator. It would be almost forty years before the United States Navy had another submarine. The next navy submarine was designed and built by American John P. Holland, an immigrant from Ireland. De Villeroi’s drawing of the Alligator. The first United States Submarine (never commissioned as a navy ship). People are very brave to get into those!